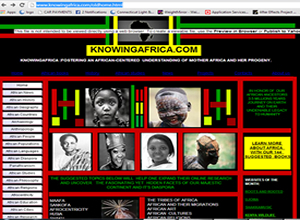 The Knowing Africa Project is growing into a multimedia platform designed to educate the world about Africa and the transformations happening on the ground.The Project is focused on Africa today and what is possible for the people, the villages, the cities, nations, the regions, the continent and it’s extended Diaspora.The restoration of Africa image is important and it is a duty for all Africans. Because Africa is the birthplace of Humanity we are proud to undertake a century long journey if needed to replace the perceptions and stigma the world has fabricate for the continent in its own interests . The establishment of a durable and enriching relation with Africa requires knowing Africa.Once more people are exposed to the continent , they will enjoy and benefit from a place that has never stop giving the world .From peopling the world ,to now getting ready to feed the world Africa has always been their. Many love the continent others have no clue about a place housing the greatest deserts , rainforests , lakes , rivers , animals and flora in one hand. For many others greed, exploitation and acquisition of precious minerals , land grab, selling weapons, occupying land and destructing ancients paradises and civilizations have been the motivation for studying Africa and keeping Africans in a state of war and arrested development .Yet despite years of suffering the resilient continent is today immerging from a long lethargy and is slowing taking its rightful place among the world best frontiers of business, renewable energy , green revolution, bleu and black oil , Minerals research ,business development , human development , trade and investments. Africa’s Emerging leadership is now focus on Africa’s greatest potential , it’s youth and it’s unlimited human capital .The African spirit and ingenuity is producing fine grade talents both at home and abroad and we are angry to transform our lives , have a greater say in our affairs , trade and integrate better trough business and efficient up-to-date transportations systems. Business as usual that meant exploration without manufacturing is over. Aid Model with donors without investments is over. Corruption with impunity will also be eradicated by a much more engaged and educated African middle class demanding better services and governance. The Good news is that Africa as many success stories. African thinkers and change makers are all over the continent and all over the cities and villages .They grew up loving the continent and they are dedicated to investment and not Aid for the continent. They are opening businesses, changing cities trough better governance and challenging the Eurocentric solutions that are not working for the growth and development of the continent .The New African is working harder, getting better educated, growing confidence in business and investment possibilities within and he or she is well travel, understands and work with more African leaders, change makers and nations. This site will shine a positive light in the rapidly changing continent that is quickly becoming a frontier market for investors. We will keep you interested in the affairs of the African continent and it Diaspora by sharing the good news and fighting preconceptions and false information about the continent. Here, we believe that he establishment of a durable and enriching relation with Africa requires knowing Africa. To love , enjoy and benefit from a better than ever Africa will require from us the knowledge of the multifaceted angles of the Motherland .Deep dives , in-depth research and reporting may be needed or simply a flight to the continent many countries .Sometime a good book , a good African study debate or just a conversation with Africans in the know will do .We are committed to facilitate your knowledge of Africa and to create a multi-disciplinary space for a better understanding of the continent . Restoring the positive image of Africa is now more than ever possible because of an integrated world we are leaving in. Therefore are a privilege and a rewarding enterprise to dedicate our life to helping the world respect and understand Africa. Joomla template created with Artisteer by Ntando Nkala-Sarr.